So if I'm blogging from set reporting you know not much is going on. However I might as well fill you in on what is going on because I know 140 characters doesn't tell you very much. We got the bus here and arrived at some shut gates. 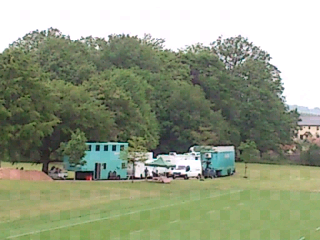 We could see the FATTs vans but obviously couldn't get to them. So we went for a walk. Eventually we got to the public entrance to the golf club, hotel and everything that seems to make up this complex of buildings. We walked through until we saw the castle. 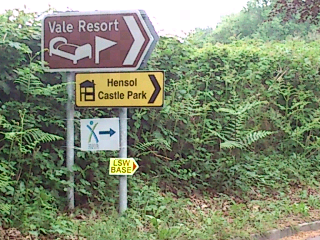 We've ended up sat between the base and the castle (the location.) There isn't much to see, especially with my eyesight (which is worse than my mobile's camera, I have discovered) Our highlight so far has been glimpsing Matt Smith being driven from the base to loc through the viewfinder of our camera. So sum news so far? 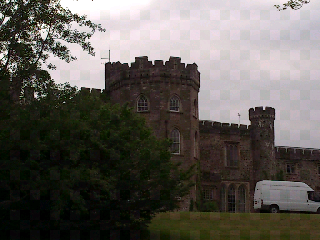 - They're at a pretty castle with a lot of grassy grounds. They're shooting interiors. 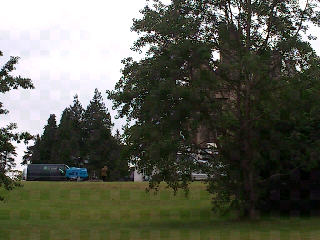 - Matt Smith is here, and we've only seen him sans jacket, wearing the shirt and waistcoat we saw him in at Margam Park. - There's little activity so possibly it's going to be a late-ish shoot.